Sylvia had her 1 year check-up last night and everything went well. I laughed about the 4th percentile.... I mean really, can't you call it the 5th percentile at least? Do you think it is possible to go to the Mall of America, get dinner for two, pick up a pair of Victoria's Secret underwear, buy two greeting cards, and 40 professionally developed pictures for $10.02? Well it is!!! The family had a great adventure at MOA tonight and we figured that we should brag a bit about our great frugality. When we got home, Sylvia celebrated her parent's cheapness! She didn't do much eating, but she sure made a mess. After a quick 'bath' and outfit change it was time to open presents. She got a lot of great gifts with her favorite being the tissue paper! Pair that with some tupperware and she is good for hours! Thanks everyone for a great, memorable day along with all the fun gifts. You have brought us lots of smiles this year. Hope this collage can bring smiles to many others. Once again we are having issues uploading pictures to the blog. Here are a few from last weekend. 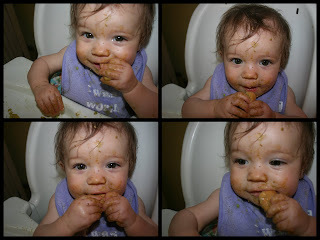 Here is Sylvia's 1st cake eating experience. I think it is obvious that she enjoyed it! We will keep trying to get more uploaded. Daddy can I have pony for my birthday? Yesterday was an interesting day, to say the least. But before everyone worries about Sylvia... she is fine. Her daddy, not so much. I took yesterday off from work to put some finishing touches on the cabin for the 4th of July Celbration. Dad and I were putting in some fence and while I was pounding a fence post in, the steel fence post driver caught on the top of the post, quickly changed directions, and slammed into the top of my head. After a trip to the Cokato clinic, which included a tetanus shot and eight stitches in the scalp, Dad and I headed to the Buffalo Hospital for a CT Scan. The good news is that the results turned out fine. Dad drove me back home and I rested the remainder of the day. Ben and Bonnie were kind enough to take Sylvia for a walk so Jamie and I could get some last minute packing done for the weekend. I am not sure what they talker about during her walk, but after Sylvia's bath last night, we were all playing on the floor and she took two unassisted steps! I made that head injury seem to disappear, as we focused on Sylvia hoping she would take more steps. Not last night, but it is just around the corner. P.S. - For those who plan on coming out to the lake tomorrow, I have to mention the water was green again yesterday. We are not sure what is causing this, but it seems to come and go in a couple days. I am hoping that Saturday will be clean again, but needed to let you all know.